Iron Man Watches use top quality Japanese quartz movement to provide accuracy time. 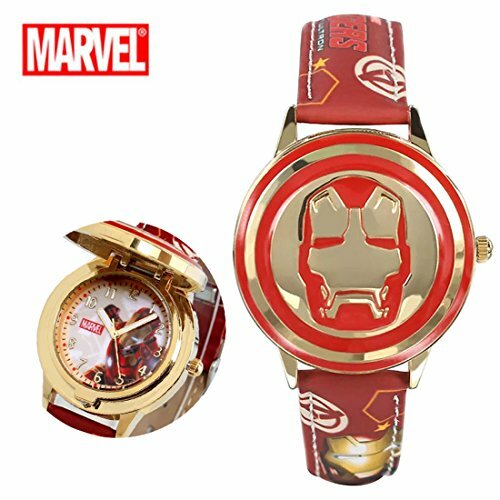 And The funny cartoon style watches with its cute styled character with 3D Iron Man design. Besides, the Comfortable Leather Strap with Healthy environmental material will not hurt kid's Skin. Particularly it is daily waterproof and shock resistant. So you don't need to worry about it will be damaged when kids are playing. That's good choice for kids Birthday Gift. It's perfect fits for 3-10 years old Kids to learning how to tell Time. If Your child is learning how to read time or understand how to tell time in a fun and engaging world effective, it's best choice for kids, they will have their "OWN WATCHE". NOTE: Please DO NOT press any buttons in the water or wear this watch for longtime underwater activities-such as diving etc. Too much water contact or usage in extreme Hot or Cold temperature will shorter watch life. 1.Please avoid the use in extreme hot or cold temperature. 2.Clean the strap by a soft cloth on regular bases is highly recommended. 3.Too much water contact will shorten watch life. 4.Different computer have different monitor,the color may be a little difference and some 1-3 cm deviation in manual measurement. Thanks for your understanding. PRECISE TIME: Kids watch use Japanese-Quartz Movement to provide precise and accurate time keeping; top quality battery to provide permanent power for watch to long lasting using. Marvel's Iron Man Face Clamshell and Iron Man characters on dial. So special Design make your kids handsome. SAFE & COMFORTABLE: Safe and high quality leather strap, soft and comfortable for wear; uses healthy environmental protection material, through international CE certification, can be rest assured to wear for you and your kids. 3D IRON MAN DESIGN: 3D cute IRON MAN FACE design, each cartoon figures are lively and interesting. All figures are designed by professional designers from color to tiny details. You and your kids will love it. Waterproof & SHOCK RESISTANT: Water Resistant to 99 feet, withstands rain and splashes of water, but not suitable for swimming; Metal Steel case and Stainless Steel case back which enable the watch to be tough and durable. The glass is made from the highly clear resin material imported abroad and sealed with the case by high frequency machine. So that the glass is extremely hard and pressure-tolerant. EASY TO READ FOR KIDS: Big Round dial window for easy to read. Adjustable strap is suit for 14-16CM ( 5.5-6.29 inch) in circumference wrists to wear, perfect for ages 3-10 years old kids to learn time. It's amazing gifts for your kids who love Iron Man. If you have any questions about this product by BRANDSALE, contact us by completing and submitting the form below. If you are looking for a specif part number, please include it with your message.